Norseman Viking Long Sword | BUDK.com - Knives & Swords At The Lowest Prices! This medieval design is quickly recognized as the preferred sword of the Norsemen who terrorized Europe for nearly 400 years. 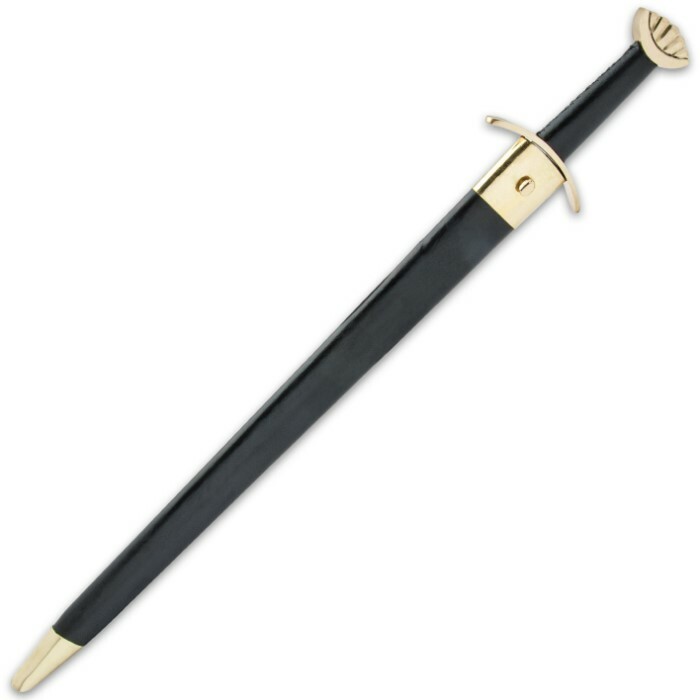 This historical replica features a 30" polished, high carbon steel blade with a heavy blood groove. The authentic styled handle offers a wooden grip with imitation leather wrap and a solid brass guard and pommel. This historical replica is perfect for historical reenactments, costumes and theatrical productions. I just received this sword for my birthday and am blown away by it. It is absolutely fantastic everything I was hoping it would be a steel of a deal. The Norseman Viking long sword is what I was looking for and serves my purpose well. I did not expect Harald Fairhair's actual sword, this one is good. The scabbard is as tight as my dad's wallet on allowance day, but that is ok. I was very happy with the price, the delivery time (Three days ahead of schedule), and the sword. It is straight and tight, and fairly represents a viking sword! Done deal and thanks BudK! This is an excellent sword, does not come sharp. 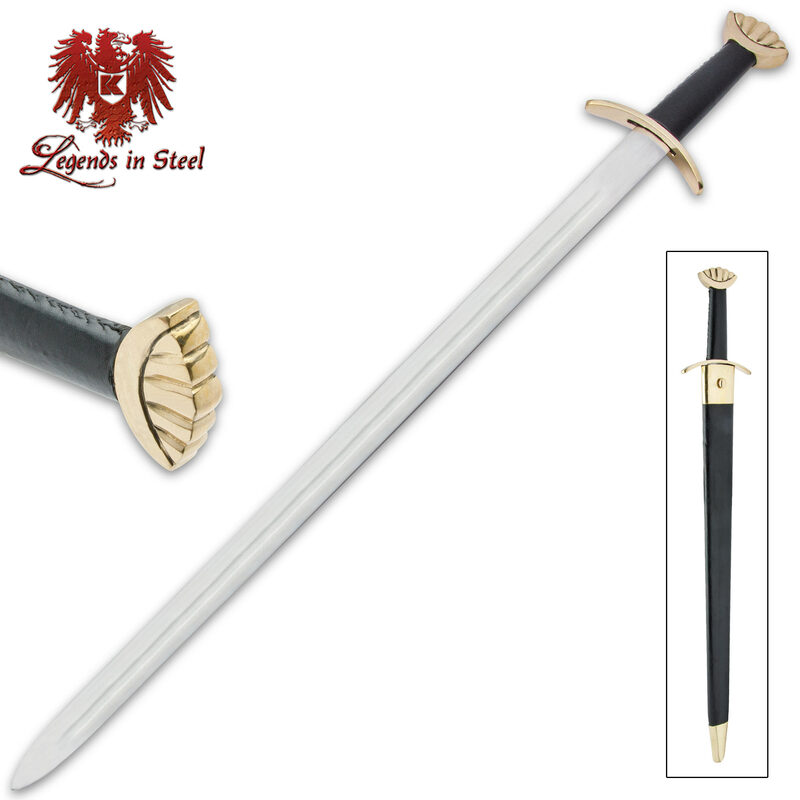 Made of High Carbon Teel, which is SO much better than stainless for a sword ( less brittle ). This is a nice (non combat) sword... It's a deal at 35$ The scabbard on mine cracked slightly when I first inserted the sword, but otherwise, it's fine. I'm keeping mine nice and oily, assuming it's actually steel and not stainless. Fun to swing a little bit, just don't hit anything! I ordered this sword based on reviews and I agree that the scabbard is pretty crappy. Oh well. I'm not going to hang it on my wall in the scabbard anyway. My sword was very well made though, and for $35 you can't go wrong. Might make my own scabbard for it if I want it as a costume piece. I plan on ordering another one at some point and displaying them together with my sons' names engraved on the blades. The fact that there is no edge on the blade doesn't bother me at all since they are for display and I have small kids. I have other swords with sharp edges to play around with that are put away. Really nice looking and worth the money. I'm sure you could tinker with it and make a functional blade out of it and if you screw up, it's not like you're out a lot of money. Folks, if you are paying less than 200 for your swords you will most definatly not be able to use them in combat or against any hard surface such as wood or metal or stone etc you will break it, this site is good for decorative weapons only!